A recent report from Adobe looks at the readiness of Asia Pacific marketers for Digital. The top line is that the industry is gaining in Digital confidence regionally, but budget and talent deficits are hampering development. One of the key points was that APAC Digital spend still sits well below global average, which is between 25%-35% of total marketing spend. 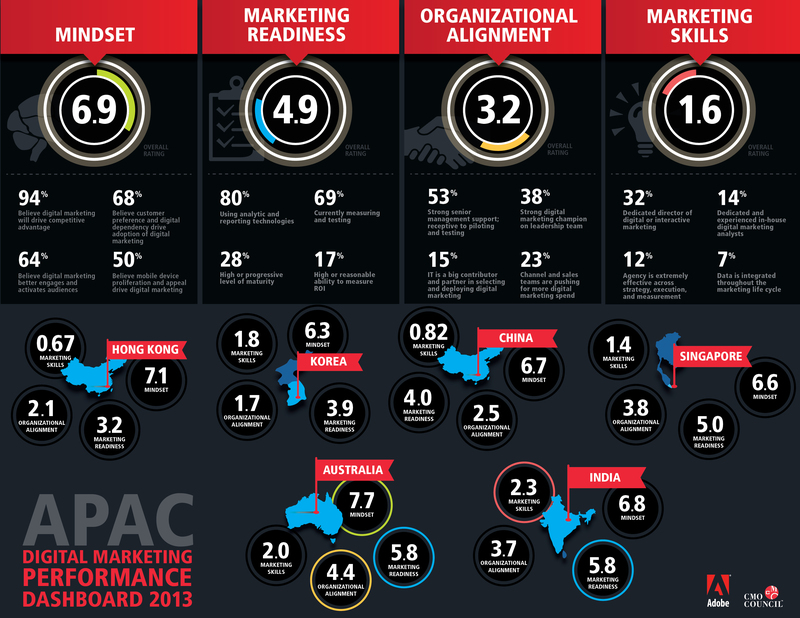 Only 14% of marketers in APAC are spending on a par with this global baseline. Regionally, 71% spend less than a quarter of their budget on Digital. Another important finding was that although a strong majority of APAC marketers are measuring and testing Digital campaigns, lack of access to the right skills means they are unable analyse the data and tap into the business-driving metrics that will help convince senior management to increase investment. Critical performance indicators such as customer lifetime value (only 15% are measuring), churn rate (9%) and market share improvements (12%) are not assessed, as many marketers continue to incorrectly manage campaign performance using CTR or CPC. Skills shortages also continue to be a significant issue across APAC. 53% said their current employees don’t have the right skills and expertise, and 48% said they lack budget to hire skilled senior staff. An important takeaway is that APAC marketers need to increase the sense of urgency around Digital marketing. Customer preference and dependence on Digital is clear. Digital marketing is a necessity, not an additional component or a nice-to-have strategy. In order to achieve this, investment in ongoing staff training is absolutely crucial, alongside a focus on the right measurement. Looking at business-driving metrics, rather than clicks and fans, will help convince senior management to increase investment. John Sinke covers this, alongside other common regional issues, in the below presentation looking in detail at how to create a more Digital business. An executive summary of the Adobe report can be downloaded here. There are also market snapshots available on Australia and Japan, with more promised.